Bachelor of Biological Science with Honours, Pontificia Universidad Catolica de Chile. Research Interests: Gaby's central area of interest is parasite ecology. 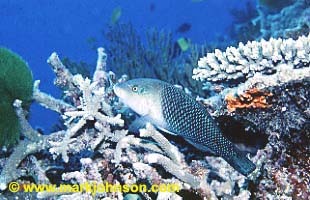 Currently, she is interested in communities of parasites in fishes. 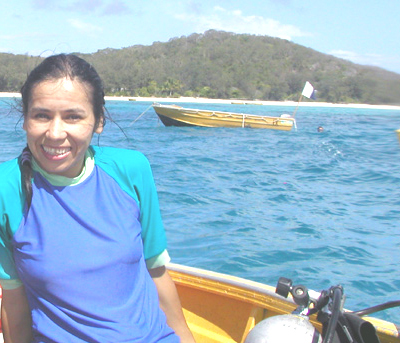 However, in the past Gaby studied symbiotic relationships in crustaceans and trophic habits in fishes. She has also carried out taxonomic studies of fish parasites in Chile. Research Project: Gaby commenced her PhD project in 2002 under the supervision of Lexa Grutter and Dr Tom Cribb. PhD project: "Patterns in the community structure of parasites in wrasses (Pisces: Labridae): An approach at infracommunity and component community levels"
The aim of this project is to investigate the community structure of parasites in wrasses and variables that affect it. Principally, host body size, microhabitat, and parasite body size could affect the abundance, distribution and density of parasites. This research will also focus on infracommunities and component communities of parasites because Gaby's interest is in the patterns and general relationships among variables, parasites and hosts. Muñoz, G. 1997. Gayana Oceanología (Chile) 5:33-39. (In Spanish). Muñoz, G. & M. George-Nascimento. 2000. Revista Chilena de Historia Natural 72:49-56. M. George-Nascimento, et al. 2000. Bull. Environ. Contamin. Tox. 64: 184-190. Goldberg S. R., et al. 2001. Herpetological Review 32: 41. Muñoz, G. & M. George-Nascimento. 2001. Journal of Parasitology 87(5): 1106-1111. Muñoz G., F. et al. 2001. Boletín Chileno de Parasitología 56: 29-33. (In Spanish). C. Hernandez, et al. 2001. Revista de Biología Marina 36:99-108. (In Spanish). Muñoz, G. 2001. Revista Chilena de Historia Natural 74: 755-761. (In Spanish). Muñoz, G. & M. George-Nascimento 2002. Journal of Parasitology 88: 141-145. Muñoz G., V. Valdebenito & M. George-Nascimento . Food and metazoan parasite fauna of the thornfish Bovichthys chilensis Reagan, 1914 (Pisces: Bovichthydae) in central Chile: geographical and ontogenetic variations. Revista Chilena de Historia Natural 75(4): 661-671, (Spanish). GEORGE-NASCIMENTO , M. F. GARCIAS, & G. MUÑOZ. Parasite body volume and infracommunity patterns in the southern pomfret Brama australis (Pisces: Bramidae). Revista Chilena de Historia Natural 75(4): 835-839 . Muñoz, G., M. T. González, & M. George-Nascimento . Similascarophis n. gen. species (Nematoda: Cystidicolidae) parasitizing marine fishes off the Chilean coast (in press Journal of Parasitology).